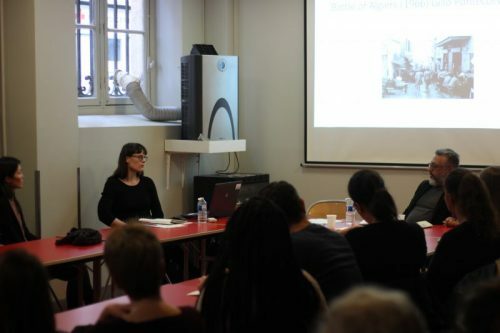 On Saturday, January 26, 2019, the Paris Institute for Critical Thinking (PICT) hosted the second installment of the PICT Honorary Lectures series at the Maison des Associations Madeleine Reberioux, Mairie du 3e arrondissement de Paris. 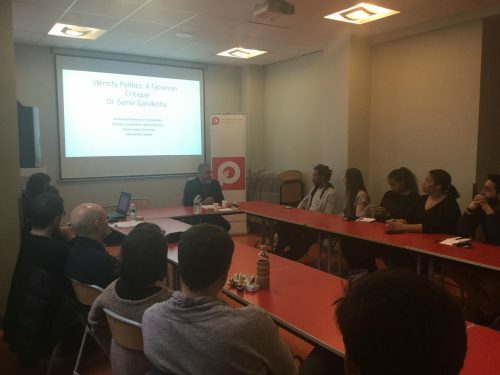 The talk, entitled “Identity Politics: A Fanonian Critique,” was delivered by PICT honorary member Prof. Dr. Samir Gandesha, Associate Professor in the Department of the Humanities and the Director of the Institute for the Humanities at Simon Fraser University, British Columbia, Canada. 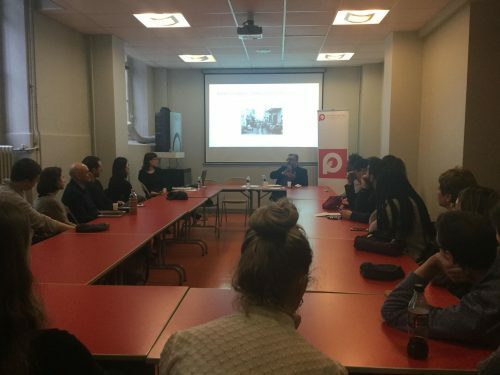 An internationally recognized expert on modern European thought and culture, Prof. Gandesha has held visiting positions at universities around the world, including the Suzhou University of Science and Technology in China (2017) and the University of Sao Paulo in Brazil (2019). Prof. Gandesha’s work has appeared in journals such as Political Theory, Philosophy and Social Criticism, and European Journal of Social Theory, and his co-edited volumes include Spell of Capital: Reification and Spectacle (University of Amsterdam Press, 2017). He is a regular contributor to openDemocracy. 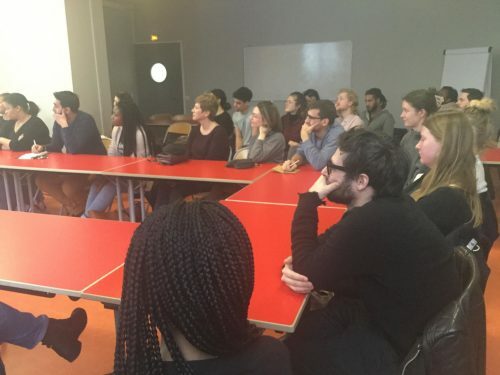 The event began with an introductory talk by PICT visiting faculty member Dr. Willow Verkerk in which she laid out the basic concepts and debates surrounding identity politics and took questions from the audience. 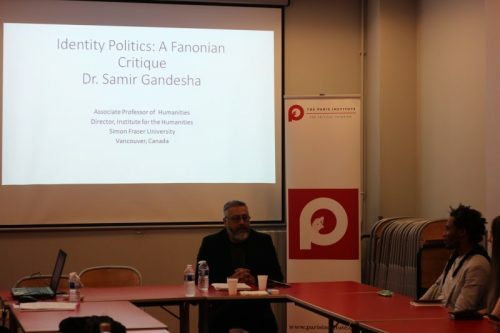 Following this, Prof. Gandesha took the stage to elaborate his take on identity politics as informed by the work of philosophers such as Hegel, Marx, and Fanon. 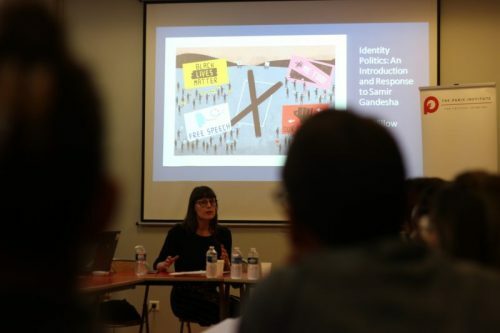 While maintaining that group identity is a powerful mobilizer for political action, Prof. Gandesha also highlighted the pitfalls of identity politics, namely its tendency to reify certain kinds of experience as belonging exclusively to specific identity groups, thereby rendering communication and cooperation across groups problematic if not impossible. 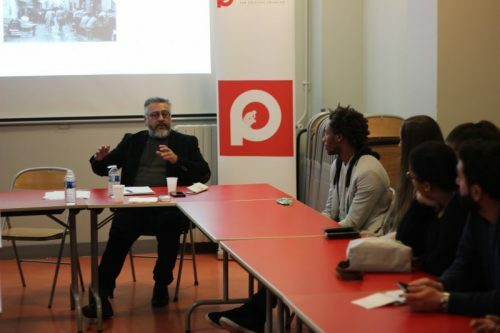 Giving examples from contemporary art and politics, Prof. Gandesha argued that even misinformed and insufficient perspectives from outside an identity group may fruitfully contribute to an open and engaged debate, and that such debate is an essential part of politics.